Arithmetic or arithmetics (from the Greek word ἀριθμός, arithmos "number") is the oldest and most elementary branch of mathematics, used by almost everyone, for tasks ranging from simple day-to-day counting to advanced science and business calculations. Quotes listed alphabetically by author, : A larger part of the quotes originates from Memorabilia mathematica or, The philomath's quotation-book by Robert Edouard Moritz. Published 1914. Alexander Bain. Education as a Science, (New York, 1898), p. 288. Reported in Moritz (1914). Arithmetic and geometry, those wings on which the astronomer soars as high as heaven. Robert Boyle. Usefulness of Mathematics to Natural Philosophy; Works (London, 1772), Vol. 3, p. 429. Reported in Moritz (1914). If scientific reasoning were limited to the logical processes of arithmetic, we should not get far in our understanding of the physical world. One might as well attempt to grasp the game of poker entirely by the use of the mathematics of probability. The abacus, with its beads strung on parallel wires, led the Arabs to positional numeration and the concept of zero many centuries before the rest of the world; and it was a useful tool— so useful that it still exists. Florian Cajori (1893), A History of Mathematics, p. 1. A hieratic papyrus, included in the Rhind collection of the British Museum, was deciphered by Eisenlohr in 1877, and found to be a mathematical manual containing problems in arithmetic and geometry. It was written by Ahmes some time before 1700 B.C., and was founded on an older work believed by Birch to date back as far as 3400 B.C.! This curious papyrus -- the most ancient mathematical handbook known to us -- puts us at once in contact with the mathematical thought in Egypt of three or five thousand years ago. It is entitled "Directions for obtaining the Knowledge of all Dark Things." We see from it that the Egyptians cared but little for theoretical results. Theorems are not found in it at all. It contains "hardly any general rules of procedure, but chiefly mere statements of results intended possibly to be explained by a teacher to his pupils." Florian Cajori (1893) A History of Mathematics p. 10. Florian Cajori (1893), A History of Mathematics, p. 21. "I couldn't afford to learn it," said the Mock Turtle with a sigh. "I only took the regular course." "Reeling and Writhing, of course, to begin with," the Mock Turtle replied; "and then the different branches of Arithmetic - Ambition, Distraction, Uglification, and Derision." Lewis Carroll, Alice's Adventures in Wonderland, Chapter IX. Arithmetic and geometry are much more certain than the other sciences, because the objects of them are in themselves so simple and so clear that they need not suppose anything which experience can call in question, and both proceed by a chain of consequences which reason deduces one from another. They are also the easiest and clearest of all the sciences, and their object is such as we desire; for, except for want of attention, it is hardly supposable that a man should go astray in them. We must not be surprised, however, that many minds apply themselves by preference to other studies, or to philosophy. Indeed everyone allows himself more freely the right to make his guess if the matter be dark than if it be clear, and it is much easier to have on any question some vague ideas than to arrive at the truth itself on the simplest of all. Rene Descartes. Rules for the Direction of the Mind; Torrey’s Philosophy of Descartes (New York, 1892), p. 63. Reported in Moritz (1914). No man acquires property without acquiring with it a little arithmetic, also. Ralph Waldo Emerson (1850) Representative Men. What mathematics, therefore are expected to do for the advanced student at the university, Arithmetic, if taught demonstratively, is capable of doing for the children even of the humblest school. It furnishes training in reasoning, and particularly in deductive reasoning. It is a discipline in closeness and continuity of thought. It reveals the nature of fallacies, and refuses to avail itself of unverified assumptions. It is the one department of school-study in which the sceptical and inquisitive spirit has the most legitimate scope; in which authority goes for nothing. In other departments of instruction you have a right to ask for the scholar’s confidence, and to expect many things to be received on your testimony with the understanding that they will be explained and verified afterwards. But here you are justified in saying to your pupil “Believe nothing which you cannot understand. Take nothing for granted.” In short, the proper office of arithmetic is to serve as elementary 268 training in logic. All through your work as teachers you will bear in mind the fundamental difference between knowing and thinking; and will feel how much more important relatively to the health of the intellectual life the habit of thinking is than the power of knowing, or even facility of achieving visible results. But here this principle has special significance. It is by Arithmetic more than by any other subject in the school course that the art of thinking—consecutively, closely, logically—can be effectually taught. Joshua Girling Fitch Lectures on Teaching, (New York, 1906), pp. 292-293. Reported in Moritz (1914). Gottlob Frege (1884) The Foundations of Arithmetic, p. 99. Gottlob Frege, Montgomery Furth (1964) The Basic Laws of Arithmetic: Exposition Ofthe System. p. 10. Carl Friedrich Gauss (1801) Disquisitiones Arithmeticae, Article 76. About the proof of Wilson's theorem. Carl Friedrich Gauss (1801) Disquisitiones Arithmeticae, Article 329. The higher arithmetic presents us with an inexhaustible store of interesting truths,—of truths too, which are not isolated, but stand in a close internal connexion, and between which, as our knowledge increases, we are continually discovering new and sometimes wholly unexpected ties. A great part of its theories derives an additional charm from the peculiarity that important propositions, with the impress of simplicity upon them, are often easily discoverable by induction, and yet are of so profound a character that we cannot find their demonstration 273 till after many vain attempts; and even then, when we do succeed, it is often by some tedious and artificial process, while the simpler methods may long remain concealed. Carl Friedrich Gauss, Preface to Eisenstein’s Mathematische Abhandlungen (Berlin, 1847), [H. J. S. Smith]. Reported in Moritz (1914). Mathematics is the queen of the sciences and arithmetic the queen of mathematics. She often condescends to render service to astronomy and other natural sciences, but in all relations she is entitled to the first rank. Carl Friedrich Gauss, Sartorius von Waltershausen: Gauss zum Gedächtniss. (Leipzig, 1866), p. 79. Carl Friedrich Gauss On higher arithmetic. Mathematical Circles Adieu (1977) by Howard W. Eves. Ian Hacking (1975) The Emergence Of Probability Chapter 12, Political Arithmetic, p. 102. Arithmetical symbols are written diagrams and geometrical figures are graphic formulas. David Hilbert, Mathematical Problems; Bulletin American Mathematical Society, Vol. 8 (1902), p. 443. Reported in Moritz (1914). Arithmetic is the science of the Evaluation of Functions, Algebra is the science of the Transformation of Functions. George Holmes Howison, Journal of Speculative Philosophy, Vol. 5, p. 175. Reported in Moritz (1914). An ancient writer said that arithmetic and geometry are the wings of mathematics; I believe one can say without speaking metaphorically that these two sciences are the foundation and essence of all the sciences which deal with quantity. Not only are they the foundation, they are also, as it were, the capstones; for, whenever a result has been arrived at, in order to use that result, it is necessary to translate it into numbers or into lines; to translate it into numbers requires the aid of arithmetic, to translate it into lines necessitates the use of geometry. Lagrange. Leçons Elémentaires sur les Mathématiques, Leçon seconde. p. 262. Reported in Moritz (1914). Iamblichus (c. 245 - c. 325) The Theology of Arithmetic On the Monad. Leopold Kronecker (1823-1891) quoted in A. George, D.J. Velleman (2002) "Philosophies of Mathematics". p. 13. Maria Price La Touche, The Letters of a Noble Woman (1908), ed. Margaret Ferrier Young, letter dated July 1878, p. 49 (quoted in Mathematical Gazette, Vol. 12, 1924). If you find my arithmetic correct, then no amount of vapouring about my psychological condition can be anything but a waste of time. If you find my arithmetic wrong, then it may be relevant to explain psychologically how I came to be so bad at my arithmetic, and the doctrine of the concealed wish will become relevant—but only after you have yourself done the sum and discovered me to be wrong on purely arithmetical grounds. It is the same with all thinking and all systems of thought. If you try to find out which are tainted by speculating about the wishes of the thinkers, you are merely making a fool of yourself. You must first find out on purely logical grounds which of them do, in fact, break down as arguments. Afterwards, if you like, go on and discover the psychological causes of the error. C. S. Lewis (1941) "Bulverism". Thomas Malthus (1798) An Essay on The Principle of Population. Chapter I, paragraph 18, lines 1-2. George Ballard Mathews, Theory of Numbers, (Cambridge, 1892), Part 1, sect. 1. George Ballard Mathews, Theory of Numbers, (Cambridge, 1892), Part 1, sect. 29. George Ballard Mathews. Theory of Numbers, (Cambridge, 1892), Part 1, sect. 48. Reported in Moritz (1914). George Ballard Mathews, Theory of Numbers, (Cambridge, 1892), Part 1, sect. 167. John McCarthy (1995) Progress and its substanability. On the one side we may say that the purpose of number work is to put a child in possession of the machinery of calculation; on the other side it is to give him a better mastery of the world through a clear (mathematical) insight into the varied physical objects and activities. The whole world, from one point of view, can be definitely interpreted and appreciated by mathematical measurements and estimates. Arithmetic in the common school should give a child this point of view, the ability to see and estimate things with a mathematical eye. Charles Alexander McMurry. Special Method in Arithmetic, (New York, 1906), p. 18. Reported in Moritz (1914). The “Disquisitiones Arithmeticae” that great book with seven seals. Joachim Merz, A History of European Thought in the Nineteenth Century, (Edinburgh and London, 1908), p. 721. Reported in Moritz (1914). That fondness for science, … that affability and condescension which God shows to the learned, that promptitude with which he protects and supports them in the elucidation of obscurities and in the removal of difficulties, has encouraged me to compose a short work on calculating by al-jabr and al-muqabala, confining it to what is easiest and most useful in arithmetic. Muhammad ibn Mūsā al-Khwārizmī (c.780-850) as quoted in: Victor J. Katz (2009) A history of mathematics: an introduction. p. 271. George Myers. Monograph on Arithmetic in Public Education, (Chicago), p. 21. Reported in Moritz (1914). Pythagoras, as everyone knows, said that "all things are numbers." Francis Wayland Parker, Talks on Pedagogics, (New York, 1894), p. 64. Reported in Moritz (1914). 1. 0 is a number. 2. The immediate successor of a number is also a number. 3. 0 is not the immediate successor of any number. 4. No two numbers have the same immediate successor. 5. Any property belonging to 0 and to the immediate successor of any number that also has that property belongs to all numbers. Giuseppe Peano As expressed in Galileo's Finger: The Ten Great Ideas of Science (2003) by Peter Atkins, Ch. 10 "Arithmetic : The Limits of Reason", p. 333. All relations are either qualitative or quantitative. Qualitative relations can be considered by themselves without regard to quantity. The algebra of such enquiries may be called logical algebra, of which a fine example is given by Boole. Quantitative relations may also be considered by themselves without regard to quality. They belong to arithmetic, and the corresponding algebra is the common or arithmetical algebra. In all other algebras both relations must be combined, and the algebra must conform to the character of the relations. Benjamin Peirce (1882) Linear Associative Algebra. § 3. You see then, my friend, I observed, that our real need of this branch of science [arithmetic] is probably because it seems to compel the soul to use our intelligence in the search after pure truth. Aye, remarked he, it does this to a remarkable extent. Have you ever noticed that those who have a turn for arithmetic are, with scarcely an exception, naturally quick in all sciences; and that men of slow intellect, if they be trained and exercised in this study … become invariably quicker than they were before? And, moreover, I think you will not easily find that many things give the learner and student more trouble than this. On all these accounts, then, we must not omit this branch of science, but those with the best of talents should be instructed therein. Plato. Republic, [Davis], Bk. 7, chap. 8. Reported in Moritz (1914). Arithmetic has a very great and elevating effect, compelling the soul to reason about abstract number, and if visible or tangible objects are obtruding upon the argument, refusing to be satisfied. Plato. Republic, [Jowett], Bk. 7, p. 525. Reported in Moritz (1914). Let us... see the geometer at work and seek to catch his process. The task is not without difficulty; it does not suffice to open a work at random and analyze any demonstration in it. We must first exclude geometry, where the question is complicated by arduous problems relative to the rôle of the postulates, to the nature and the origin of the notion of space. For analogous reasons we can not turn to the infinitesimal analysis. We must seek mathematical thought where it has remained pure, that is in arithmetic. Pythagoras, as everyone knows, said that "all things are numbers." This statement, interpreted in a modern way, is logical nonsense, but what he meant was not exactly nonsense. He discovered the importance of numbers in music and the connection which he established between music and arithmetic survives in the mathematical terms "harmonic mean" and "harmonic progression." He thought of numbers as shapes, as they appear on dice or playing cards. We still speak of squares or cubes of numbers, which are terms that we owe to him. He also spoke of oblong numbers, triangular numbers, pyramidal numbers, and so on. These were the numbers of pebbles (or as we would more naturally say, shot) required to make the shapes in question. ...He presumably thought of the world as atomic, and of bodies as built up of molecules composed of atoms arranged in various shapes. In this way he hoped to make arithmetic the fundamental study in physics as in aesthetics. Bertrand Russell A History of Western Philosophy (1945) Book One, Part I, Chapter III, Pythagoras, p. 35. Unfortunately for Pythagoras, his theorem led at once to the discovery of incommensurables, which appeared to disprove his whole philosophy. So long as no adequate arithmetical theory on incommensurables existed, the method of Euclid was the best that was possible in geometry. When Descartes introduced co-ordinate geometry, thereby again making arithmetic supreme, he [Descartes] assumed the possibility of a solution of the problem of incommensurables, though in his day no such solution had been found. Bertrand Russell A History of Western Philosophy (1945), Book One, Part I, Chapter III, Pythagoras, p. 35-6. Bertrand Russell A History of Western Philosophy (1945), Book One, Part I, Chapter III, Pythagoras, p. 37. Not only philosophers were influenced by Plato. Why did the Puritans object to the music and painting and gorgeous ritual of the Catholic Church? You will find the answer in the tenth book of the Republic. Why are children compelled to learn arithmetic? The reasons are given in the seventh book. Bertrand Russell A History of Western Philosophy (1945), Book One, Part II, Chapter XV, The Theory of Ideas, p. 120. Plato proceeds to an interesting sketch of the education proper to a young man who is to be a guardian. ...The young man chosen for these merits will spend the years from twenty to thirty on the four Pythagorean studies: arithmetic, geometry (plane and solid), astronomy, and harmony. These studies are not to be pursued in any utilitarian spirit, but in order to prepare his mind for the vision of eternal things. In astronomy, for example, he is not to trouble himself too much about the actual heavenly bodies, but rather with the mathematics of motion of ideal heavenly bodies. This may seem absurd to modern ears, but, strange to say, it proved to be a fruitful point of view in connection with empirical astronomy. Bertrand Russell A History of Western Philosophy (1945), Book One, Part II, Chapter XV, The Theory of Ideas, p. 130. 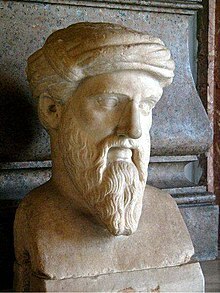 It is noteworthy that modern Platonists, almost without exception, are ignorant of mathematics, in spite of the immense importance that Plato attached to arithmetic and geometry, and the immense influence that they [these studies] had on his philosophy. This is an example of the evils of specialization: a man must not write on Plato unless he has spent so much of his youth on Greek as to have no time for the things that Plato thought important. Bertrand Russell A History of Western Philosophy (1945), Book One, Part II, Chapter XV, The Theory of Ideas, p. 132. I should agree with Plato that arithmetic, and pure mathematics generally, is not derived from perception. Pure mathematics consists of tautologies, analogous to "men are men," but usually more complicated. To know that a mathematical proposition is correct, we do not have to study the world, but only the meanings of symbols; and the symbols, when we dispense with definitions (of which the purpose is merely abbreviation), are found to be such words as "or" and "not," and "all" and "some," which do not, like "Socrates," denote anything in the actual world. A mathematical equation asserts that two groups of symbols have the same meaning; and so long as we confine ourselves to pure mathematics, this meaning must he one that can be understood without knowing anything about what can be perceived. Mathematical truth, therefore, is, as Plato contends, independent of perception; but it is truth of a very peculiar sort, and is concerned only with symbols. Bertrand Russell (1950) Unpopular Essays. p. 136. Jean-Baptiste Say (1832) A Treatise On Political Economy Book I, On Production, Chapter XVII, Section III, p. 188. "Any graduate of the ___ Business School should be able to beat an index fund over the course of a market cycle." Statements such as these are made with alarming frequency by investment professionals. In some cases, subtle and sophisticated reasoning may be involved. More often (alas), the conclusions can only be justified by assuming that the laws of arithmetic have been suspended for the convenience of those who choose to pursue careers as active managers. William F. Sharpe, "The arithmetic of active management." Financial Analysts Journal 47.1 (1991): 7-9. Time is naturally associated by us with counting, which is the simplest of all rhythms. It is surely no accident that the words 'arithmetic' and 'rhythm' come from the two Greek terms which are derived from a common root meaning 'to flow'.